Home » Blog » What to Avoid » What’s in your kid’s yummy birthday cake? 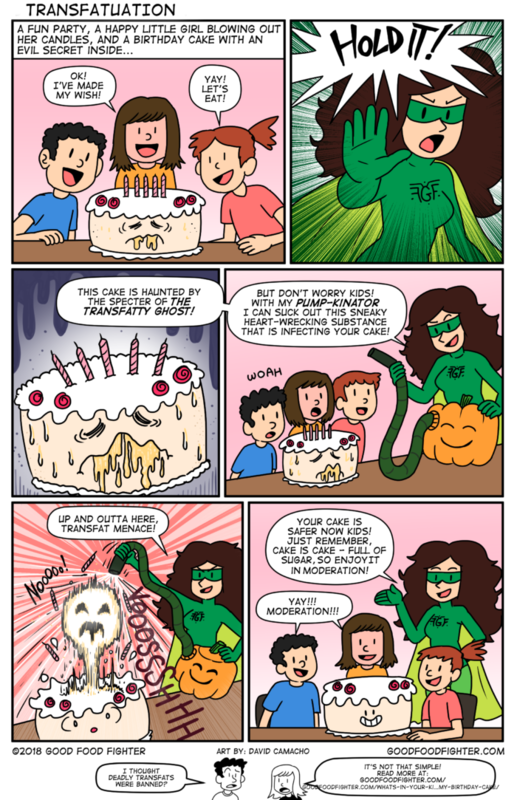 What’s in your kid’s yummy birthday cake? Trust me, if you love your kid, you want to know. 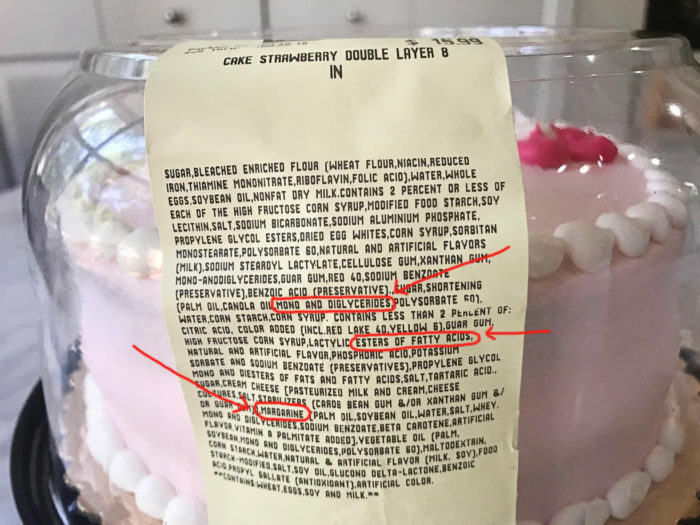 There are a lot of problematic ingredients in cakes everywhere, but what stunned me two weeks ago is that one of the ingredients is actually banned in this country. That’s right, partially hydrogenated oils (PHOs) have been studied extensively and there is such overwhelming evidence of harm that the Federal Drug Administration (FDA) finally prohibited their use. The food industry was alerted in 2016—two years ago—about the dangers of PHOs and were given a timeline for removing the chemical. That’s right—they had two years. The ban took effect in June 2018. 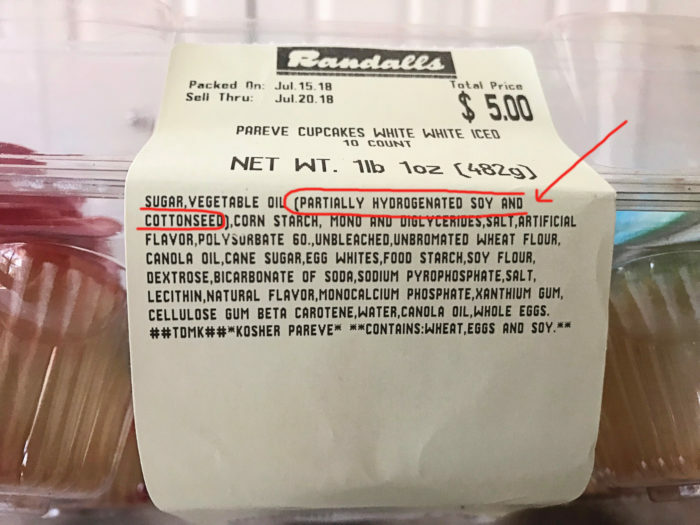 That’s why I couldn’t believe it when I saw transfats on an ingredient label for birthday cakes and cupcakes—geared towards kids—at my local grocery store in Austin. Want to know about some of those other ingredients? Yes you do! According to the FDA website, partially hydrogenated oils (PHOs) are the primary dietary source of artificial trans fat in processed foods. Removing PHOs from processed foods could prevent thousands of heart attacks and deaths each year. What exactly are transfats? These fats occur naturally in minute amounts in meat and dairy, but the kind that has been banned is manufactured in a lab by manipulating vegetable oil to make it solid. Is this cake contraband? Should it be removed from the shelf? I can’t be sure. The FDA has made a few exceptions to cause as little disruption as possible to companies so as to protect their profits while exposing consumers to continued health risks. According to the FDA’s website, companies can petition for more time—till Jan 2018—”for products produced prior to June 18, 2018 to work their way through distribution“. Did this store make thousands of cakes in May 2018 as the deadline loomed so that they could defrost and sell them for as long as possible? Or perhaps this cake is much older? I don’t know the answer to these questions, but I can tell you that I don’t want this cake in my mouth, or anywhere near my kid’s mouth. 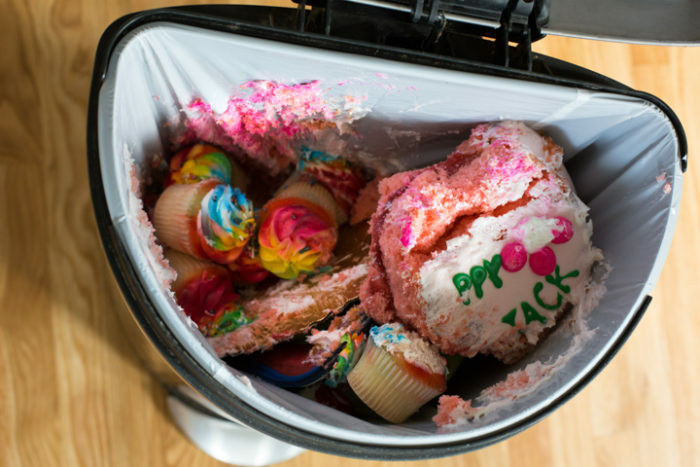 I am tempted to buy and dispose of all the cakes and cupcakes on the table by the front door just so that they don’t go into your kid’s mouth, either. Top Left: “Packed on July 15”. What does that mean? Is it going on a trip? : stores can petition to keep using partially hydrogenated oils for another year and a half—till January 2020—in order to ensure an “orderly transition in the marketplace”. 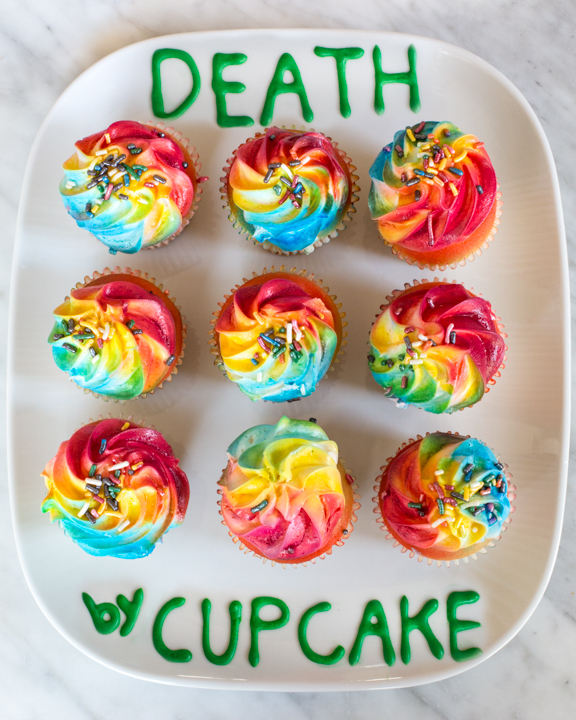 So it is possible that this company has petitioned to sell these cakes for as long as possible knowing that they include ingredients known to cause heart failure in order to protect their bottom line. What is an “orderly transition in the marketplace?” My understanding is that companies have been given a generous cushion of time to reformulate and test replacements that are cheap and convenient and will not impact their profits. I wish that they would embrace the opportunity to search for ingredients that come from real food, but I will not hold my breath. Does anyone else think this is just plain wrong? Are you outraged yet? Well here’s your chance to vote with your wallet. Also with your voice. And with social media. Get the word out. When you see transfats on products at your local grocer or bakery, speak up. Write a review. Share this article. Protect your kids and your friends’ kids. Buy a different cake. Anything else in those cupcakes I don’t want to eat? Why, yes there are. In the cake, too. Scroll back up for the ingredient lists. There’s barely an ingredient that I would allow in my house, unless it was to photograph for educational purposes to help you understand what not to buy and why. Am I going to scarf down those irresistible cupcakes after photographing them? The rainbows are so pretty! Nope. My body is not a garbage can. Shining the spotlight on Transfats. In 2006, the New York City Board of Health unanimously approved a ban that gave restaurants until July 2008 to phase out the use of artificial trans fats. Ten years later, stores in Texas–and probably in many places–are putting transfat in your child’s birthday cake. The negative effects of hydrogenated trans fats. Epidemiological data suggest that when trans fat percentages go up and linoleic acid percentages go down, death rates rise; when trans goes down, death rates go down. 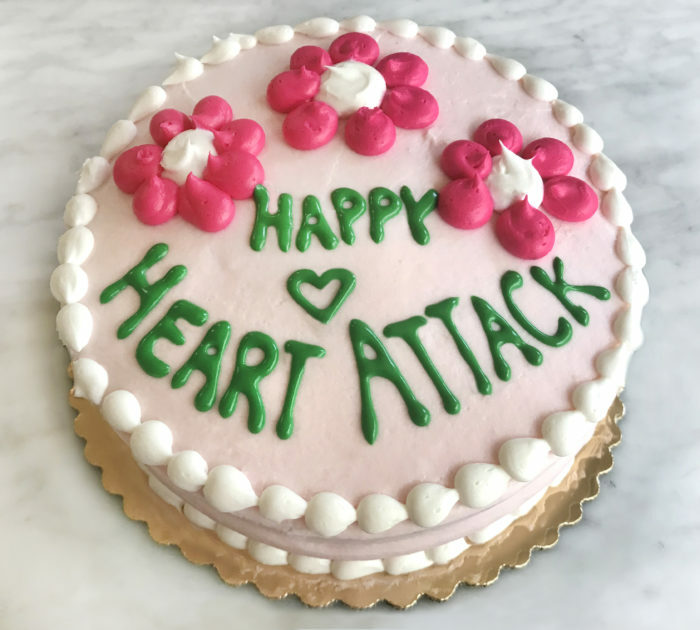 No matter—brands that care only about profit will find a way to use only the cheapest ingredients-including transfat–to birthday cakes. Trans fats are hiding all over your grocery list. In 2015, the Environmental Working Group identified more than 87,000 foods that contained transfat. These should have all disappeared from the food supply by June 2018. But if they are still lingering in my local birthday cakes, you can be sure they are in lots of other products, too. Want some better cake ideas? Check out my other post on dangerous cakes and scroll down to the safe alternatives. Save your life by becoming a more savvy shopper!